Some of you may know that there was another Westie in the house before me. Yes, there was a "Starter Westie" in the house. And still they got another one ??? His name was Max and he was loved by all. They called him The Ambassador in the neighborhood because he was one of those pups who knew everybody. There was no such thing as a quick walk with Max, because he had to go out twice a day and catch up with every dog and every person in the entire neighborhood. He's a tough act to follow, I tell you. But I must be doing something right, because this weekend I got to start wearing his collar. Max was a big boy and I am a little on the smaller side, so my dad had to do some adjusting to it, but I think I wear it pretty well, don't you? Proud to be his brother! 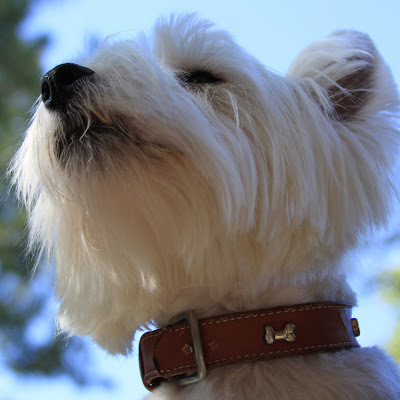 Duncan, you look grrreat in brother Max's collar! Duncan, we are sure Max is very proud of you, he's watching you know!